Best inspirational real life stories have you heard ? Inspirational Real Life Stories – Lata Bhagwan Kare, a 66 year old woman, is a resident of an small village in Buldhana district in Maharashtra. She lived with her three daughters and husband. She and her husband worked very hard throughout their lives and got their daughter married. All their life’s savings were spent on the marriage. Later Lata tai and her husband started working as daily wage workers in the nearby farms, they used to make enough to survive. One day her husband felt uneasy and was diagnosed with some serious infection. With no money in hand, Lata tai couldn’t understand what to do. She took him to the nearby government hospital, doctors recommended her to take him to the hospital in Baramati as a few tests had to be conducted. Lata tai was in tears, she cursed her own misery. She couldn’t see her husband dying in her arms. She felt helpless and sorrowful. As a last resort, she begged her neighbours, relatives and every possible person she could and gathered a small amount and left for Baramati for the further tests of her husband. Fate had some other story written for them. Doctor advised further costly tests and medications, which were going to cost them a fortune. Lata tai’s world collapsed as she has nowhere to go, and no money to treat her husband. The wife and husband came out of the hospital heavy-heartedly, stopped by nearby samosawala, had two samosas. The samosas were served on a piece of newspaper. Her eyes stopped on the bold Marathi headline in the newspaper; her eyes lit, heart skipped. The headline was about the ‘Baramati Marathon and it’s prize money’. Next day, Baramati Marathon was about to commence, everyone geared up in their sports shoes, cozy shorts and tracks, sweat absorbing tees. And here she comes, the 66 year old Lata Bhagwan Kare, wearing torn saree (lugda), bare footed, tears in her eyes. She argued with the organizers, as they weren’t ready to let her participate in the marathon. She pleaded, she begged, she convinced them to permit her to participate. Marathon started, she hitched her saree just above her ankles, she ran like a wizard, like a 16 year old teen. She didn’t think of anything else, she could just see nothing but her husband’s agony and the prize money. She didn’t care about the hard hitting road and pebbles hurting her feet. Her feet bled, but she ran. 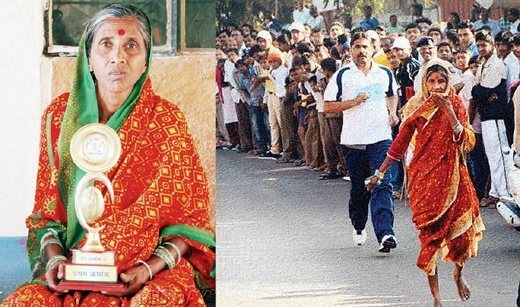 Crowd cheered her, streets of Baramati clapped for her. People were flabbergasted, they saluted her and applauded her. Finally she won the Marathon and got the prize money. It meant a lot to her as she can now save her husband. She collected the winning amount and made sure her husband received the proper medication. This is love, this is devotion. She didn’t blink in the most trying circumstances, she never thought about how she is going to win the marathon, or how is she going to run barefooted. Her only motive was to save her husband. Salutes to Lata Bhagwan Kare, for her courage and fortitude. In the world full of excuses, she just proved to be an extreme exception. Google her name to watch her clips on YouTube on how she won the marathon.